This double album has two CDs of five songs each. (Kind of wasteful, no?) 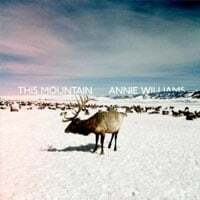 The first disc, “This Mountain,” is the lighter side of Annie Williams – more on the ballad bent with lots of maudlin strings. “Midnight Window” has some jazzier percussion and electric guitar, with a slightly lo-fi/indie feel. Williams’ voice works well on both sides; her vocals are soft and sweet without being breathless or babydoll. Vocal and emotional ranges are kept in check, but she’s able to express a wide spectrum through subtlety. In that way, while firmly in the folk realm, she has some commonality with the understated, vulnerable tones of Lykke Li and Camera Obscura. Bottom Line: Skip the chintzy first CD.